The readers will be sold under the “Galapagos” brand name and the initial two models are differentiated by their screen size. One has a 5.5-inch screen, around the same size as Amazon’s Kindle, and the other a 10-inch screen, which is just slightly larger than Apple’s iPad. Sharp says the e-readers are meant to compete more with products like Amazon’s Kindle and the Barnes and Noble Nook than tablet PCs like Apple’s iPad and Samsung’s Galaxy Tab, but comparison with the latter devices might be difficult to avoid. 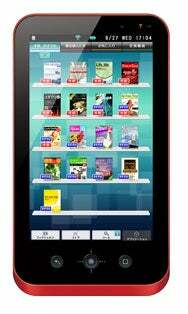 With their bright, colorful LCD (liquid crystal display) screens and shiny finish, the e-readers look more like these latter devices than traditional e-book readers. Sharp’s choice of LCD over the grey-ish e-paper screens used in e-readers isn’t a surprise—it’s one of the world’s major LCD makers—but that choice and the Android operating system could see some consumers thinking of them more as tablet PCs. Future plans call for the addition of wider e-commerce services, music, video and a Web browser, which could further distance them from the e-book market. Unlike tablet PCs they won’t necessarily be able to run Android software of the user’s choice. The devices come with some Android apps already installed, but users might not be able to download additional apps. Also, the first models have Wi-Fi but don’t come equipped with 3G wireless. Price could do a lot to define their position in the market but Sharp wouldn’t disclose that on Monday. It said pricing and full technical details would be announced closer to the launch date. For the domestic market, perhaps Sharp’s biggest challenge lies in changing the perception of the word it’s chosen as the brand name for the products: Galapagos. Best known around the world as the islands off Ecuador that are home to a large number of endemic species, “Galapagos” is perhaps most often used in the Japanese business world to refer to products or technologies that have evolved differently in Japan from the rest of the world. That may be the Sharp’s ambition, but the two e-readers unveiled on Monday and a planned e-book service that will launch in December are based on XMDF (ever-eXtending Mobile Document Format), a format developed by Sharp and largely confined to Japan. Sharp said it will later add support for the ePub format, used by Barnes and Noble and Sony in their e-readers, and other document formats including HTML, the basic language of the text Internet, and Adobe’s PDF.